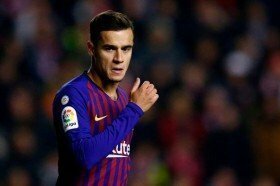 Barcelona will reportedly consider transfer bids of around £90m for the services of midfielder Philippe Coutinho in the summer. The Brazil international joined the Blaugrana from Liverpool at the start of 2018, and he has since scored 19 goals across all competitions for the club. Despite this, the Brazilian has not quite settled under manager Ernesto Valverde with starts hard to come by, especially in the Spanish top-flight where Ousmane Dembele has been preferred ahead of him. According to ESPN, the Catalan giants could be prepared to sanction the sale of Coutinho this summer, should any club come up with an offer of at least £90m. United have recently been linked with the services of the former Internacional graduate, but reports have indicated that Coutinho does not favour a Premier League return. Elsewhere, Paris Saint-Germain and Real Madrid are said to be monitoring his proceedings while there has been the talk of a big-money move to the Chinese Super League.